Water newly planted perennials, grasses and sedges deeply and slowly for the first full season if the soil is dry . Shrubs and trees need longer term watering, especially during droughts. Wind, temperature, competition from nearby trees, topography, soil texture, and other factors can affect soil moisture in different areas. Never walk, dig or place heavy equipment on wet or moist soil since this will compact the soil, reducing underground wildlife habitat, run-off infiltration and plants ability to grow. Clients: please refer to the detailed watering instructions in your design folder. Your garden will evolve and fill in over time. A few species, called pioneer plants may bloom the first year. Other slower growing plants will bloom in 3-5 years, at which point the pioneers species will taper off. Plants started from seed will take even longer. Trees and shrubs may grow in spurts, some years they grow a lot, other years they grow only a few inches. Please be patient. Your native garden is very dynamic and will change month to month, year to year according to the weather, wildlife, environmental factors and natural processes. This means a plant behaves differently in different gardens. For example, when it’s a wet year, certain species may be taller and spread more. During a drought, plants may be shorter, not bloom as much, or go dormant. Some natives, called ephemerals, go dormant after blooming regardless of the weather. This is all perfectly normal and makes your garden much more interesting! There are 2 type plants to remove: weeds and invasive plants. During the first few years, please weed your gardens regularly. Whenever a garden is installed, weeds flourish because the soil is disturbed and there are blank spaces between plants. Plan on spending 15 minutes every day or 1-2 hours each weekend weeding, or a combination that suits you. It’s best to remove weeds when they are small and before they flower or seed. Recommended weeding method: Cut the weed off at the base with a pruner, Dutch Hoe or String Trimmer instead of pulling. This will minimize disturbance. Note: weeding is necessary but a little different when starting from seed rather than live plants. Some weeds may grow back, but eventually their numbers will decrease with maintenance and as the native plants fill in. Note: it’s not necessary to remove every weed, unless it is invasive plant. If you’re not sure something is a weed, invasive or a good plant, let it flower but not spread or seed, and compare it to Internet photos or also try to “google” a verbal description of the suspected weed’s flower, leaves and stem. BTW: Some weeds are beneficial to wildlife. Please read “Why cant weed be friends”, for more information. You’ll find weeding relaxing and the best time to see wildlife up close. Invasive plants in your garden should be removed. See the Chicago Botanic Garden’s invasive species website. There are different removal methods for different invasive species, so check online resources. Common invasive plants include: Canada or Bull Thistle, White or Yellow Sweet Clover, Purple Loosestrife, Garlic Mustard, Teasel, Gout (Bishops) weed, Crown Vetch, Buckthorns, Japanese Honeysuckles, and Burning Bush. Although poison ivy is native, you may want to remove if not in natural area , where people exposure is frequent (ie. near paths) or if severely allergic. It is a great insect and bird plant. Also remove or reduce the amount of Canadian Goldenrod, Solidago canadensis (click name for photos/description) or Tall Goldenrod, Solidago altissima since both can take over a garden, and may be phytotoxic. Watch out for rabbits. Your garden is a huge salad bowl to them, especially when plants are young. I spray frequently damaged plants with Liquid Fence or similar natural product about every 1-2 weeks. Enclosing plants or new gardens with chicken wire is another solution. Chicken wire may be helpful In winter, when rabbits are more likely to eat trees and shrubs since they are accessible above the snow. 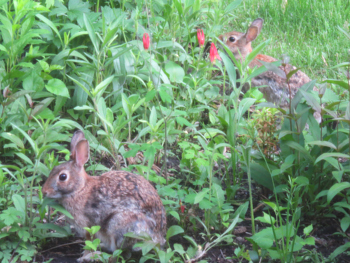 Rabbits love New Jersey Tea, Chokeberry, Prairie Clover, Shooting Stars, Columbine, Wild Petunia, but there are other favorites. In general, your native plants provide food and shelter for wildlife, so expect some damage. Remember rabbits are part of the natural food chain just like other wildlife are, so never hurt or poison them. Watch for native plants spreading more than you want or growing in unwanted areas. It is natural for many natives to spread or grow into other locations (by seed or roots/rhizomes). Do some careful editing if necessary. Remember if you remove a plant, you create disturbance and possibly a bare spot for weeds to grow. If you have a very weedy area, spreading native plants may be a good thing (along with proactive weeding). The goal is to allow the native plants to fill in, so you will have less weeding than a traditional garden, protect the soil, infiltrate more storm water run-off, and provide more habitat! Please read the article “LIving Mulch” to learn more. You can access other maintenance articles under Good-Natured Landscapes website’s Notebook(blog), by selecting the Maintenance category.